Cat Reflexology, Dog Reflexology and Energy Healing for Animals? Today’s article features two questions about pets and reflexology. If you’ve got a cat or dog and are curious about energy healing for animals, read on to learn four ways you can use energy healing to help your pet feel better and improve their overall health. Q: Do you have any suggestions for animals? I have a cat that is a year and one half old He keeps getting Kidney infections. I don’t want to lose him. I have had animals and lots of cats. I have never had a cat with kidney infections before. Do you have any suggestions? Q: Just a random question. :-) do you know if there is such a thing as reflexology for dogs? A: In my experience, I’ve found that animals respond very well and very quickly to energy healing. I suspect it’s because they’re in tune with their natural energy. Animals aren’t in their heads a lot like people are. They don’t forget their connection with nature and thus, they’re usually vibrating at the same frequency as Earth energy. That said, it’s important to recognize that energy healing should not replace proper medical care. If your pet is injured or sick, please take them to your veterinarian. This is especially true during the acute phase of an injury or disease. However, once you bring Fido or Kitty home, you can use energy healing to help support their recovery and improve their overall health. Here are four ways to get started. 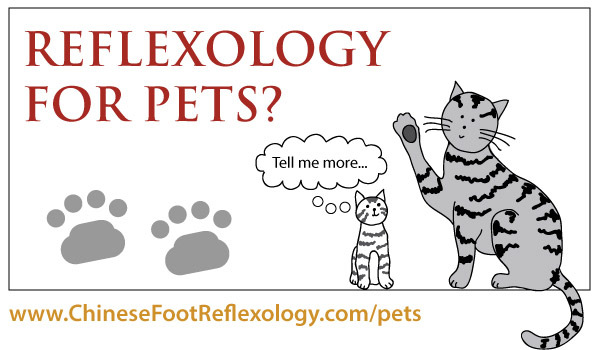 Of course, I would have to write about reflexology for cats and dogs! Until a reader asked me about this, I actually had never heard of such a thing. Reflexology for pets?!!! Being curious, I did some research online and found several books on pet massage and one specifically on, Reflexology for Cats. There was even an interesting diagram of cat paws with reflexology points mapped on it. I haven’t read this book myself, but it looks like the main premise is that massage is beneficial for your pet. This makes a lot of sense because the most healing energy of all is LOVE :). One of my clients today remarked that every culture has Reiki, it’s just called different things. He gave the example of a mother cuddling her baby. She’s sharing her love energy with her child. Pets feel your love too and respond accordingly. From a Chinese Reflexology perspective however, massaging your pet’s paws would not be as effective as massaging the Chinese Reflexology points on people. This is because of the size difference between our fingers and our pet’s paws. Our fingers and thumbs are simply too big to really target specific points. For a good comparison, this would be like using a giant potato to massage your feet. Massage is healing and therapeutic, but to give the benefits of Chinese Reflexology to your pet, you would need to massage the targeted points in a more focused manner. As well, there’s no way my cat would ever let me rub his feet! All of the energy meridians that people have, pets have too. These energy pathways are very similar in terms of where they’re located on the body as well as where the acupuncture/acupressure points are located. Because animals have similar energy pathways to humans, acupressure can be a very effective way to balance your pet’s energy meridians. While there are acupressure points on the limbs, these can be tricky to locate and massage for pets, especially cats. That’s why I like to massage the Back Shu points on my cat. Back Shu points are acupuncture/acupressure points located on the energy meridian for the bladder. They’re located on your pet’s back on either side of the spine. It is said that the Qi (life force energy) for the body’s organs are infused in these points. Thus, you can massage an organ’s Back Shu points to strengthen and harmonize the organ. For example, my cat has had issues with his kidneys and bladder. Thus, I would locate and massage the corresponding Bach Shu points for the kidneys and bladder (UB-23 and UB-28 respectively). If you’re interested in learning more, there’s a book that I highly recommend. It’s called Acu-Cat: A Guide to Feline Acupressure . IMHO, this book does an amazing job of explaining the theory of Traditional Chinese Medicine, as well as detailing the location of different points on your cat and how to massage them. Several months ago, my cat Furball appeared to be on the brink of death. He had a run-in with struvite crystals, and I took him to the regular vet for treatment. The vet didn’t offer any advice for prevention other than to feed Furball the prescription diet that turned his coat all ratty and made him vomit. I ended up putting Furball on a different brand of prescription food to help him normalize his pH levels and reduce the crystals during the acute phase of his recovery. It was okay food, but it clearly wasn’t helping him thrive. Simultaneously, I went through everything in his diet and lifestyle to figure out what could have triggered the crystals. It turned out our tap water was slightly alkaline and was alkalizing his urine. We had to buy bottled water for him. Anyhow, poor Furball began getting recurring cystitis about a month after his bout with crystals. He had already seen the vet multiple times and had been given fluids, antibiotics and antispasmodics. He seemed to get better for a few days, but then one night, he took a turn for the worse. 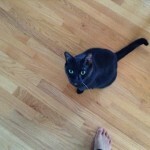 He refused to eat dinner, which is a big deal because when my cat doesn’t eat, something is SERIOUSLY WRONG. He LOVES his food. Later that evening, I found Furball lying like a limp rag at the bottom of the stairs. My normally interactive cat wouldn’t even lift his head when I spoke to him and petted him. It felt like his life force energy was draining away. He looked so pathetic that I seriously thought that my cat was going to die that evening. It crossed my mind to take him to the emergency clinic, but since he was already on medication and it was so stressful for him to go to the vet, I decided to let him spend his final few hours at home with dignity. Fortunately, a thought crossed my mind. Out of desperation, I decided to try giving him some Qi. I placed the palms of my hands on his Back Shu points for the bladder and began envisioning myself sending him healing energy. Furball healthy and happy. Yes, those are my toes. Immediately after placing my hands on Furball’s back, an amazing thing happened. He began to purr. I sat with him for an hour and when it was time for me to go to sleep, I thought I spotted a spark of life in his eyes. I woke up the next morning not knowing what to expect. Miraculously, Furball was back to his normal self. He ate all of his breakfast, he was roaming the house and he even wanted to play. It was as if nothing had happened. He hasn’t had a recurrence of cystitis since that day. To learn more about how to give your pet energy healing, I’d recommend reading my article on, How to Heal With Your Hands When Nothing Is Working and You’re Feeling Desperate. Often times, we want to help others or our pets, yet we don’t give the same amount of nurturing to ourselves. This is a disservice to your pets, your family and most importantly, you!!! While animals have a natural affinity to the balancing vibration of nature, they spend most of their time and focus most of their attention on us. Thus, they really tune into what’s going on with our energy. Think of it like trying to maintain your own rhythm while the person beside you is singing horribly loud and off-key. If our vibrational energy is not in harmony, we can adversely influence our pet’s energy. The good news is that you can balance your Qi with Chinese Reflexology, nurturing yourself and living in joy. So, go do something nice and nurturing for yourself today. Wouldn’t you want to be happy to make your pet happy too? It’s a win-win energy healing game! To learn more on how you can strengthen and balance your Qi with Chinese Reflexology, enter your email below to receive a series of mini online lessons. Enter your email to get your free lessons, complimentary Chinese Reflexology foot charts, free newsletter and exclusive savings on workshops and classes. Because of the volume of emails I receive and because I’m a full-time mom, I unfortunately can’t answer everyone’s questions personally. However, I do read EVERY email and consider your words when deciding what to write about. Thank you for your feedback! Do you believe in holistic healing for pets? If so, please help spread the word by clicking one of the buttons below. Thank you.